Lot 151 C/I Oval Notice. 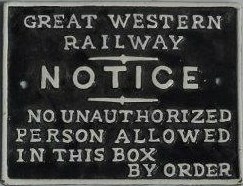 "GREAT WESTERN RAILWAY - NOTICE - NO UNAUTHORIZED PERSON ALLOWED IN THIS BOX - BY ORDER". Restored condition.